When a detainee, or their family, establishes a bond, they are promising that all scheduled court dates will be attended. A bond is a guarantee of that attendance. What are the costs of a bail bond? The fees set under this subsection of the law are limited to $25 for any criminal bail bond or homeowners or automobile insurance. State regulations limit the bond premium to 12 percent of the face amount of the bond or $120, whichever is greater. In Louisiana, each detainee seeking release from jail while under bond must pay a fee of $30 to the jail. This fee is refundable if the person is found to be not guilty of the charges. Refunds must be petitioned for by the individual. 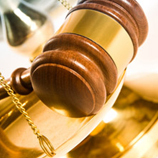 How long to it take to process a bail bond and attain release? Where the average time for release is about four to six hours, it can take up to 24 hours to get one released from jail. Our paperwork processing time is only approximately 15 minutes. Why is my premium non-refundable? Because the bail bond company is the entity responsible for the attendance of the defendant in court, it is the right of the bond agent to keep the premium for payment of this service. Do I need collateral to get a bond? Most cases do not require the need for collateral though serious criminal charges, where bail amounts can be quite high, may cause the bond agent to request collateral to be offered in order to ensure payment. Assets that are most often considered collateral include the equity in your house, plots of land, cash or vehicles and other property. When is my collateral returned to me? Upon completion of the case, when the bond has been discharged by the court. First and foremost, contact your bond agent immediately. We’ll call the court and get the details necessary to keep you out of jail, though you may be re-arrested before we can make arrangements. Therefore, it is extremely important that you understand just how serious it is if you miss your court appointments. It is your responsibility to ensure that all court instructions and mandates are adhered to. Are you looking for a bail bondsman in Louisiana? When you use A-1 Affordable Bail Bonds, you don’t have to worry about typing “bail bonds near me” into a search engine, because we serve all of Louisiana. No matter what parish you’re in, we’re here to help. Our goal is to provide our customers with a level of service that’s simply unmatched in our industry. We’ll go above and beyond for you because you’re worth it. If you’re in need of help, put your trust in the pros at A-1 Affordable Bail Bonds. We’ll be there for you when you need it the most.